Today's Draw: The Chariot from the Kitty Kahane tarot. Do you have a good sense of what you can and can't control in life? Do you often find yourself giving your power over to others? Who drives your chariot? The Chariot can mean a lot of things, depending on how you read it. It can talk about the momentum that drives you toward success. It can speak of focus and control. And it can also talk about being pulled in opposite directions. In the book for this particular deck, however, the author says something interesting that I've never considered before. She talks about how we all have left-hand strength that's different from right-hand strength, depending on which is our dominant hand. And that keeping the Chariot on course is not just a function of grabbing the reigns and exerting force. It's a dance between your hands and the reigns...a constant recalibration of effort between the power in each arm vs. the power it takes to steer the horses. When people are striving for something in their lives, they look for formulas that work. But, like with the Chariot, there often is no set formula. No auto pilot. (Or, for Airplane fans, Otto Pilot.) Life and success and pretty much everything in between is a series of maneuvers you have to feel your way through, constantly recalibrating your efforts. And so, in one sense, control is a reality because you're fine tuning the entire way. In another sense, control is an illusion, because you're just really feeling your way through—you can't control the variables that come your way. You can only control the way you respond to them. That's life in a nutshell, isn't it? You can't control what comes your way, but you can control how you respond to it. Yet so many put more attention on trying to control their environment—the variables around them. Then they respond in a certain way and blame their response on the variables. If I'm not communicating properly, what I guess I'm trying to say is that we're responsible for the way we respond to things. We can't say, "I did this because so-and-so did that." That's a cop-out. Nobody made you do anything. They might be a stimulus or variable—they may even be one of the horses—but they don't drive your Chariot. Unless, of course, you give them that power. 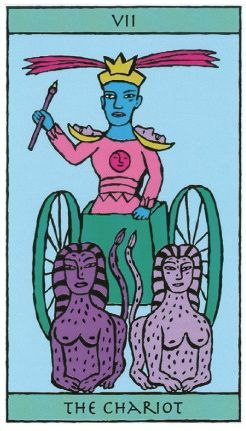 The Chariot is the vehicle that drives you toward success in life. But you have to know how to drive it, what you're in control of and how to calibrate your response to the stimuli you can't control. If you spend your time in the weeds trying to control things that are out of your purview, you won't be prepared to handle the things you CAN control. So who are you letting drive your Chariot today?